I saw a gentleman get in security line behind me with an autographed bat in a case and I didn’t give it a second look. We were all leaving the 2012 National Sports Collectors Convention and seeing a guy walk around with an autographed baseball bat didn’t alarm me at all. I knew he was carrying it because he cared about it and didn’t want any harm to come to it. The idea of him breaking it open during the flight to take over a plane seemed comical to me, but the reality of living in a post 9/11 world is that you can’t bring something like that on a plane. When the TSA agent let him know he couldn’t bring it, he was crushed. He was already late for his flight and this meant he would have to go back and check it. But he couldn’t just check it as it was, he would need to find packaging for it as well to insure it was not damaged. I felt for him as he most certainly missed his flight over this misstep and likely had to spend another day in Baltimore. Does TSA hate collectors? Probably not, but it doesn’t matter who signed the baseball bat, hockey stick or golf club; they will not allow you to carry one on board an airplane. 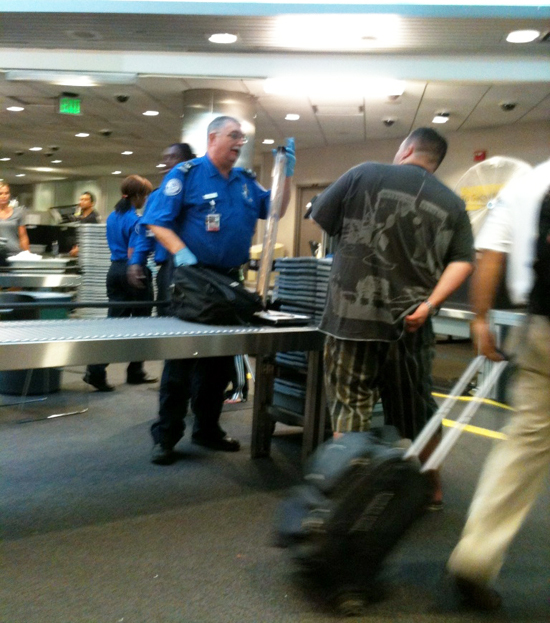 UPDATE 3/5/13 – TSA has eased some restrictions on items you can travel with. Golf clubs, hockey sticks, ski poles and pool cues are now good to go. Your baseball bats however are still blacklisted. Have you ever had TSA give you grief over trying to carry on your favorite sports collectibles? In 2002, on my way from California to Oregon, TSA stopped me and questioned me for five minutes trying to ascertain what was in my see-through platic container snugly packed with cards in toploaders. The toploaders looked like wires when lookin at the screen ofthe z-ray machine. They brought a supervisor over to confirm I had only baseball cards. Good times. But you can bring a whole bag of tennis racquets. Makes no sense really.